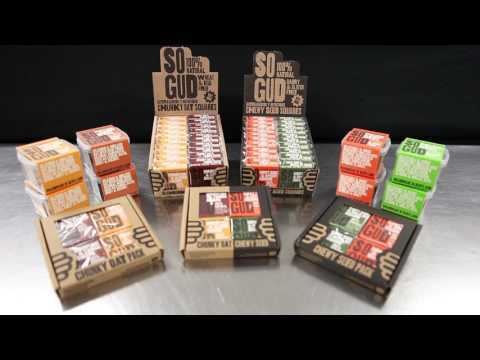 Sogud is a Scottish snack manufacturer with a unique gluten free product. Fund their first order from a large UK distributor. Share their success. Paid back in full on 25 Sep 17 1 day early!!! Sogud is owned by Terri and Neil Petrie. They believe their business is about people and making food that’s good for people. They are intent on searching for whole, natural, nutritionally dense ingredients and finding innovative ways to produce foods that people love. They have just signed their first distributor, Fife Creamery in Scotland. They seek funding to be able to fulfil large orders with this distributor for over £6,000. This partnership gives them access to accounts such as Scottish Universities, NHS, Dobbies, Scotmid, CJ Lang and National Trust for Scotland. Sogud Gluten Free Snacks successfully raised £6,160 to fund the production of 280 cases 708 days ago. Check back soon for more offers. When their friends and colleagues raved about Terri and Neil's early efforts, they took advice from the Rowett Institute (Aberdeen) and Queen Margaret University (Edinburgh) for product development and began manufacturing themselves. The products are now sold by over a hundred stockists across the UK and have just received their first large order from a major distributor! Sogud are funding their production for £22.00 per case. Each case has 20 squares. They expect to make and sell the product in just 4 months and can pay you back plus a profit of 5.5% on top. Share their success here. Fund the production of delicious wholesome snacks made from natural ingredients. Packed in retail ready cases of 20. For such a healthy product, you will be surprised at the wonderfully rich taste of butter and delicate natural sweetness of honey and dates in these handmade snacks. With each mouthful, you become aware of the wholesome ingredients such as wholegrain oats, coconut and chia seeds, which is beautifully accompanied by the nuttiness of the almond. This incredibly moreish snack is packed with carefully selected natural ingredients that you might find in your kitchen cupboard. There are no artificial ingredients, colourings, refined sugars and is certified gluten free.